Vascular grafts are used to redirect blood flow from one part of the body to another by connecting blood vessels. Vascular grafting surgery is performed to treat ischemia caused by atherosclerosis, organ transplantation, or for vascular access in hemodialysis. However, demand for vascular grafts is anticipated to decline during the forecast period owing to increase in adverse effects like decellularized xenogeneic grafts increase the rate of infection, thrombosis, and aneurysms. The global vascular grafts market was valued at US$ 2,010.1 Mn in 2017 and is projected to expand at a CAGR of 5.0% from 2018 to 2026 to reach US$ 3,000 Mn by 2026. High incidence rate of cardiovascular diseases, peripheral diseases, and rise in geriatric population are likely to fuel the growth of the global market from 2018 to 2026. Surge in government investment in health care infrastructure and strategic alliances among players to penetrate the emerging markets are expected to propel the global market during the forecast period. In terms of product, the global vascular grafts market has been segmented into endovascular stent grafts, peripheral vascular grafts, hemodialysis access grafts, bypass grafts, and others. The endovascular stent grafts segment held the largest market share in 2017. Moreover, the segment is anticipated to expand at a high CAGR during the forecast period due to high demand for minimally invasive surgeries and rise in preference for stent grafts to treat atherosclerosis. Based on source, the global market has been classified into synthetic, biological, and biosynthetic. The synthetic segment is projected to dominate the global market during the forecast period owing to its good materialistic properties such as flexibility. In terms of size of vascular graft, the global vascular graft market has been bifurcated into large and small. The small segment is expected to expand at a high CAGR due to increase in focus of major players on the development of small size vascular grafts to treat narrow vascular atherosclerosis. Based on end-user, the global market has been divided into hospitals, ambulatory surgery centers, cardiac catheterization laboratories, specialty clinics, and others. The hospitals segment accounted for the largest market share in 2017. The segment is expected to expand at a significant CAGR during the forecast period. North America is projected to account for major share of the global vascular grafts market from 2018 to 2026, supported by rise in prevalence of cardiovascular diseases and increase in the number of vascular surgeries. According to the Journal of Vascular Surgery (2012), critical limb ischemia is associated with significant cost to the U.S. health care system and is estimated to exceed US$ 3 Bn annually. According to data provided by the American College of Cardiology, more than 130 million adults in the U.S. are anticipated to have some form of cardiovascular diseases (CVD) by 2035, and the total cost of CVD is expected to reach US$ 1.1 Trn in 2035. 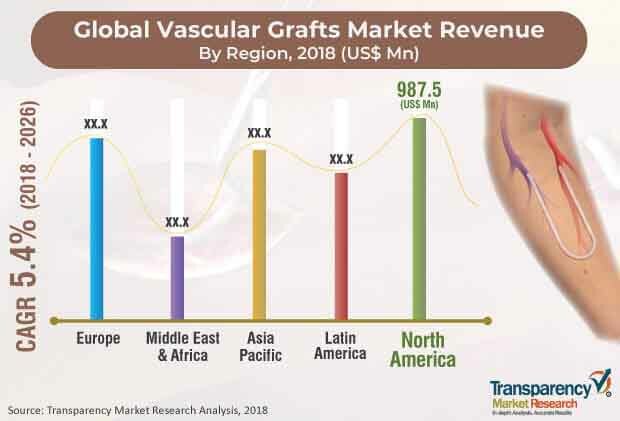 The vascular graft market in Asia Pacific is likely to expand at a high CAGR during the forecast period due to increase in focus on development of health care infrastructure by both public and private hospitals and high cardiovascular patient pool in countries such as India and China. Key companies operating in the global vascular grafts market and profiled in the report include W. L. Gore & Associates, Inc., Maquet Holding B.V. & Co. KG (Getinge Group), BD, LeMaitre Vascular, Inc., B. Braun Melsungen AG, Cook Medical, Medtronic plc, Artegraft, Inc., Vascutek Ltd., Vascular Graft Solution Ltd., Heat Medical Europe BV, and CryoLife, Inc.
Vascular grafts is a medical device that belongs to a specialized class of medical textiles. The primary purpose of a vascular grafts is to act as an artificial conduit for a diseased artery and help to redirect blood flow from one area to another. Presently, synthetic vascular Grafts are most commonly used which are made of either Dacron or Teflon. Increase in incidence of cardiovascular diseases and peripheral diseases is projected to drive demand for vascular grafts. The global vascular grafts market report comprises an elaborate executive summary, which includes a snapshot that provides information about various segments of the market. It also provides information and data analysis of the global market with respect to the segments based on product, source, size of vascular grafts, application, end-user, and region. A detailed qualitative analysis of drivers and restraints of the market and opportunities has been provided in the overview section. Additionally, the section comprises competitive matrix and company profiles along with business overview to understand the competitive landscape in the market. This section of the report also provides market attractiveness analysis by region and market share analysis by key players, thereby presenting a thorough analysis of the overall competitive scenario in the global vascular grafts market. In terms of product, the global vascular grafts market has been segmented into endovascular stent grafts, peripheral vascular grafts, hemodialysis access grafts, bypass grafts, and others. In terms of source, the market has been classified into synthetic, biological, and biosynthetic. The synthetic segment has been categorized into polytetrafluethylene (PTFE), polyurethane (PU), Dacron, and others. The biological segment has been divided into bovine vein, saphenous vein, and others. The biosynthetic segment has been bifurcated into ovine collagen with polyester and others. In terms of size of vascular grafts, the global vascular grafts market has been classified into large and small. Based on application, the market has been categorized into coronary artery bypass, aneurysm, vascular occlusion, critical limb ischemia, renal failure, and others. Based on end-user, the global vascular grafts market has been divided into hospitals, ambulatory surgery centers, cardiac catheterization laboratories, specialty clinics, and others. Geographically, the global vascular grafts market has been segmented into five major regions: North America (the U.S. and Canada), Europe (the U.K., Germany, France, Spain, Italy, and Rest of Europe), Asia Pacific (China, India, Japan, Australia & New Zealand, and Rest of Asia Pacific), Latin America (Brazil, Mexico, and Rest of Latin America), and Middle East & Africa (South Africa, GCC Countries and Rest of Middle East & Africa). The market size and forecast for each of these regions and the mentioned countries/sub-regions have been provided for the period from 2016 to 2026, along with their respective CAGRs for the forecast period from 2018 to 2026, considering 2017 as the base year. The research study also covers the competitive scenario in these regions. The report also profiles major players in the global vascular grafts market in terms of various attributes such as company overview, financial overview, product portfolio, business strategies, and recent developments. Major companies profiled in the report are W. L. Gore & Associates, Inc., Maquet Holding B.V. & Co.KG (Getinge Group), BD, LeMaitre Vascular, Inc., B. Braun Melsungen AG, Cook Medical, Medtronic plc, ArteGrafts, Inc., Vascutek Ltd., Vascular Grafts Solution Ltd., Heat Medical Europe BV, and CryoLife, Inc.